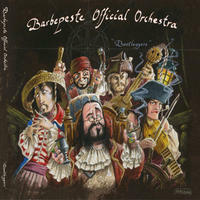 Barbepeste Official Orchestra: Ahoy and shiver your timbers to some irish world music with a smattering of pirates. The Barbepeste Official Orchestra (or B.O.O) is a French quartet, halfway between traditional Irish music and world music. Comprising Yann Righetti (cithern, mandolin, baroque guitar), Isao Bredel (nyckelharpa, singing), Yann Voegel (low whistle, tin whistle, ney, alto recorder) and Guilhem Puech (surdo, cuban cajon, military drum, darbouka, bendir), the band likes to play with old traditional Irish songs and give them new colors. And what about the "Captain Barbepeste" and the pirate aesthetics that flavors the entire project? Well, that's the common thread, the guiding light that gives sense to the global picture. One can imagine a lot of different things listening to the B.O.O., but the band always pictures pirate ambiances when composing or arranging a song: one dreams of sirens and tempests, one of jetties and taverns, one of ships that ran aground and desert islands. 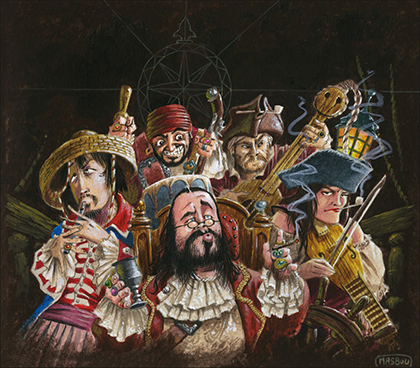 This pirate aesthetic goes beyond the music: historical costumes, old musical instruments, and a gorgeous artwork around the first album, designed by Jean Luc Masbou, a famous French comic strip writer who turns out to be a B.O.O. fan! Barbepeste Official Orchestra lives in St Sulpice, France. Tagged as: 크레이지슬롯 사이트World, Folk, Celtic.